Vegetated swales (also known as grass swales) are shallow areas built to store, filter, and transport small amounts of water before it gets to nearby storm drains. Usually vegetated with grasses, they can either have tall native grasses or turf. This makes them easy to maintain. They also reduce the temperature of water before it goes into a stream or pond -- a serious issue for sensitive species like trout. Grass swales are easy to maintain. The shallow nature of a swale allows for the use of turf which can be mown and maintained like the rest of the yard. 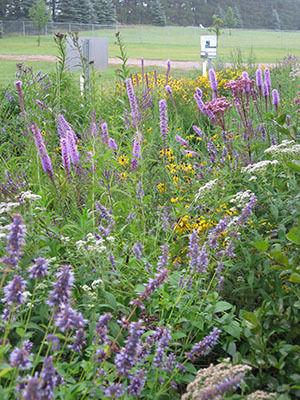 Swales also can be planted with native plants, which provide additional benefits such as wildlife habitat. In addition, their deep roots help break up compacted soil, increasing the amount of water that soaks into the ground and reducing run off into the storm drain system. View the Massachusetts LID Toolkit for more information on swale design.